Marriott Rewards, Starwood Preferred Guest and Ritz-Carlton Rewards have synchronized their systemwide global offerings for the first quarter of 2017. All three programs will offer Double Points on the first three stays at participating hotels in each program. Marriott Rewards, The Ritz-Carlton Rewards and Starwood Preferred Guest (SPG®), are each offering remarkable, new opportunities for members to earn double points as part of their coordinated promotions. 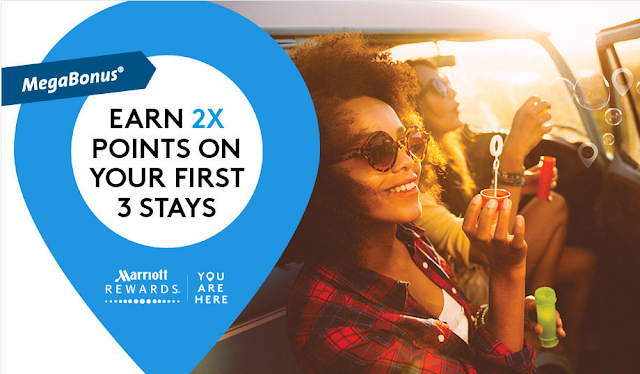 For the first time, the three programs are offering the same promotional opportunity, giving members the chance to earn double points on their first three stays at participating hotels in each program. 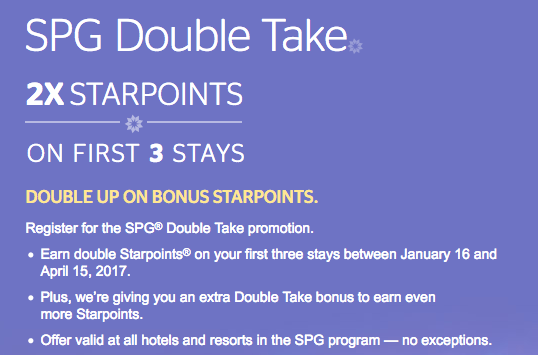 Points can be redeemed for free nights, flights, exclusive experiences on SPG Moments and Marriott Rewards Experiences Marketplace and much more. Registration begins today and you have to register by March 15 for stays between January 16 and April 15, 2017. Be sure you register for both offers! We are still waiting for registration links for SPG and Ritz-Carlton. Achieve 10 nights and you'll earn 5,000 Starpoints. After 10 nights earn 500 Starpoints for each additional night, up to 5,000 Starpoints.